Petalina’s first order from Bonnie & Pearl has just arrived. 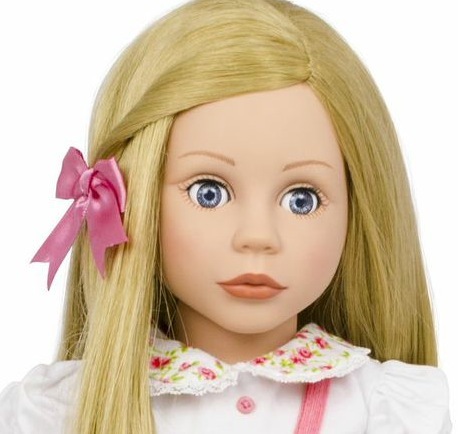 My 10 year old daughter rushed in from school, saw the open box with a blonde haired blue eyed doll inside and her immediate reaction was, “She’s beautiful!” And these dolls really are. There is something very special about them and their quality is obvious. Bonnie & Pearl is the brainchild of two Mums, Lisa Pearce-Bridgeman and Nicola Evans. Their dolls as children were the inspiration for their company as they were called (you’ve guessed it) Bonnie and Pearl. They remember how their dolls were their friends, sharing their adventures and being part of their gang. The dolls were also part of their families, taking part in day to day life and joining in at family mealtimes. Both Lisa and Nicola still have their dolls and would not be parted with them – a little like me with my family of Sasha dolls because every time I see them I am taken back to the fun and innocent play time of my childhood. In many ways Bonnie & Pearl share Petalina’s core beliefs, that dolls need to be beautiful and well made, so that they can last a lifetime. Nicola and Lisa also remember the joy of opening the box for the first time and looking inside, only to discover a friend and not just a new toy. The dolls have been designed, made and packaged with this in mind. I know if I was 8 years old again I would really want to receive one for my birthday or Christmas! Petalina first discovered Bonnie & Pearl on the day their first pop up shop opened in St David’s Shopping Centre in Cardiff. By all accounts the shop had caused quite a stir and little girls could be seen all around Cardiff carrying large pink classy carrier bags with ‘Bonnie & Pearl’ clearly displayed on each side. 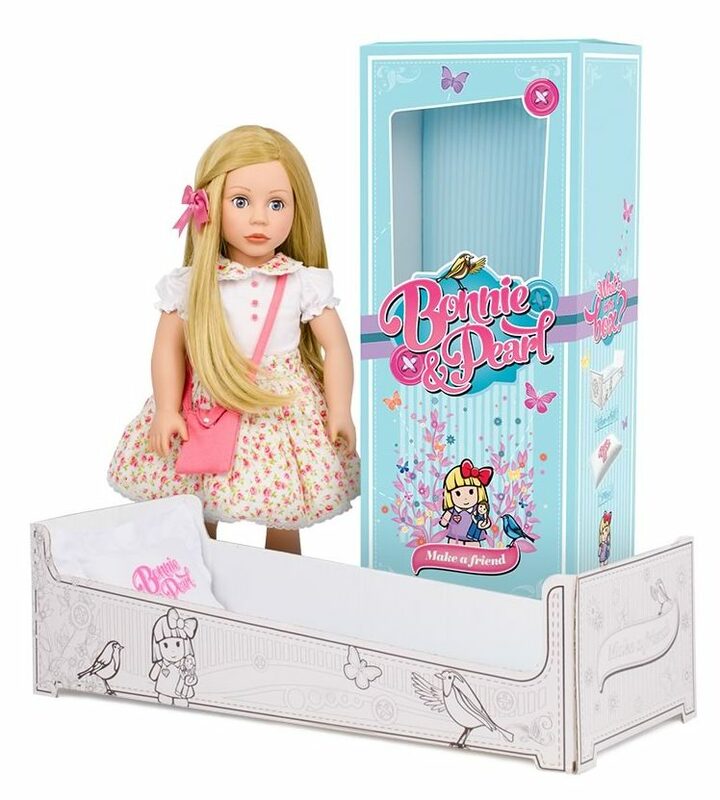 I searched for the website, rang Bonnie Towers the very next day to say ‘Hello” and ordered a doll. When the parcel arrived I was really impressed with her and so was Rosie. 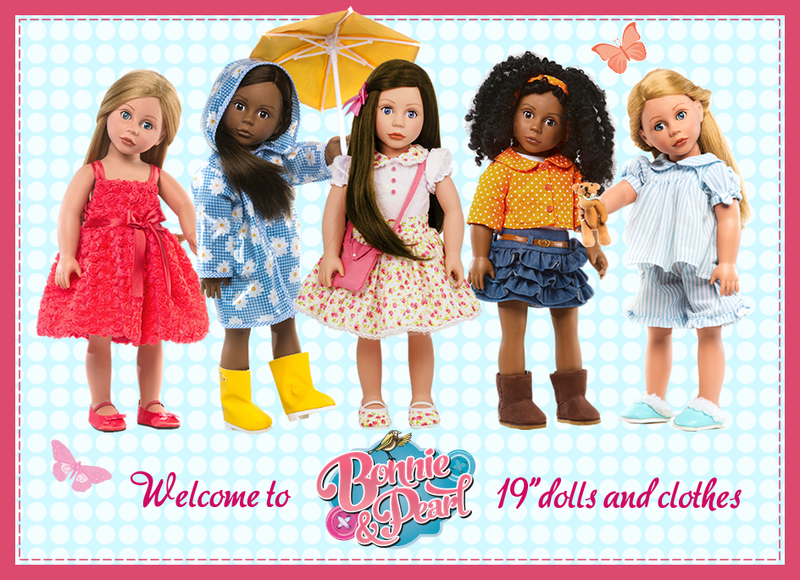 A few months later, I am delighted to be able to say that Petalina is the very first retailer of these gorgeous dolls. Remember Bonnie appeared in our Easter story? There are 7 dolls altogether. Two have light skin with blonde hair, one with brown eyes and the other with blue. Two have light skin and brunette hair, also with the option of blue or brown eyes. 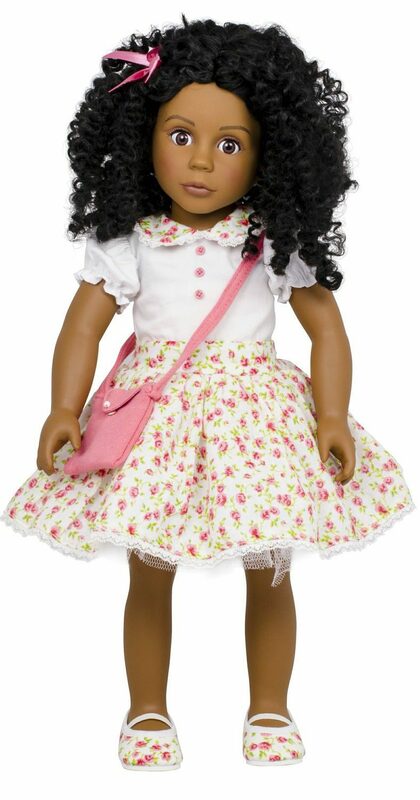 Then there are the two dark skinned dolls, both with brown eyes, one with a really super curly wig and the other has long sleek dark hair. Finally there is a stunning redhead with blue eyes. 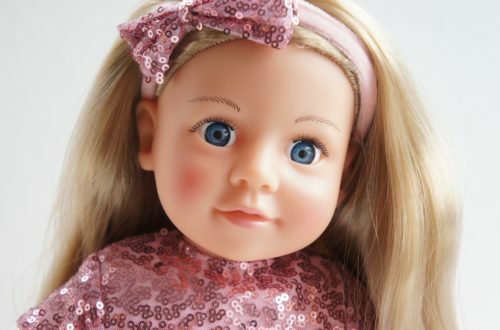 The question is of course, why was my first impression of a Bonnie & Pearl doll so positive? Everything about them is beautifully done and the overall effect of the packaging, the doll and her clothes is so pretty. Little girls are going to just fall in love with them. One of the first things I noticed was how crystal clear and sparkly her eyes are, and they close, which is a definite bonus. There is also a lot of detail because she has painted lashes around the eye socket, both on the top and bottom. Her skin is fair and a lovely colour, matt in finish yet translucent. She also has slightly blushing cheeks and the prettiest mouth. To be honest I wasn’t sure about her nose and mouth having seen the online pictures, but in the flesh they are what make her so beautiful because they are refined and delicate, and definitely cute and pretty. Her lips are carefully sculpted and painted a natural, deep lip colour, which is also matt. A very beautiful face! Another thing I checked immediately was the doll’s hair, which is a very well applied wig with neat edges. Again the quality is evident as the parting is thick and realistic without any evidence of the fabric beneath to which the hair is sewn onto. Her hair is also very long and plentiful and offers lots of hairstyling opportunities. 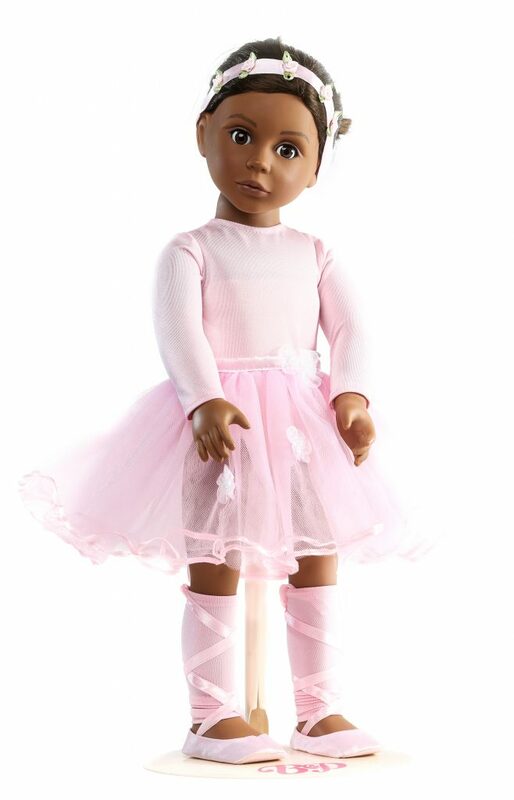 All of the Bonnie & Pearl dolls arrive in the prettiest outfit made from good quality natural fabrics. The skirt, collar and shoes are all made from white cotton covered with coral pink roses, and the little shirt is so sweet with tiny coral buttons sewn up the front. The collar and the hem of the skirt are trimmed with delicate white lace and the skirt has a gathered stiff net petticoat lining which helps to create it’s fullness. As underwear the dolls wear a pair of simple white jersey knickers. All of the dolls have a coral pink jersey cross body bag and a pretty signature hair bow sewn onto a clip in their hair. Bonnie & Pearl dolls have 5 joints. The head can be turned and tilted, the arms and legs are simply sculpted and can be moved in circles with a little outward movement. What I really love about the dolls is that they have a vinyl chest plate, which means that they look good in strappy dresses and swimsuits but they remain cuddly and tactile. The soles of the feet are flat which makes the dolls very easy to stand on their own even without shoes. One of the hands is also positioned to allow the dolls to hold things. Finally, there is the packaging, which is sturdy, prettily designed and well put together. 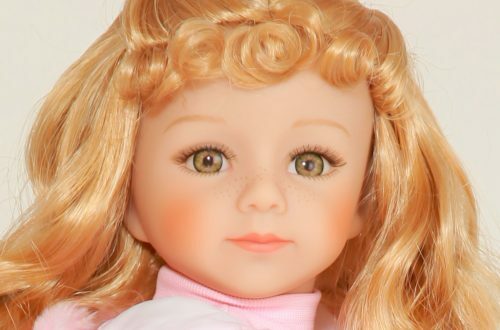 There is a small window through which the face and shoulders of the doll can be seen, but it doesn’t give away the wonderful secret which is inside the box with the doll. You see, each doll is tied with white ribbons into a cut out white card bed which slides out of the box. You have to be careful here as the bed is a good fit, which avoids damage in transit, but a little patience is needed to slowly pull the doll and bed out. What is fabulous about the bed is that it is highly patterned in black and white on the outside ready for colouring in, and the base is striped with blue and acts as the mattress. There is also a white pillow included in the box with a bright pink Bonnie & Pearl logo printed on one side. How lovely that the packaging also has a use and isn’t just thrown away. The accessories that are available for Bonnie & Pearl are also divine. You’ll notice that the outfits are made using fabrics in a range of colours (not just pink) and are the types of outfits that little girls would like to wear themselves with their mother’s approval. The outfits arrive in a small and colourful card box with a lid that can be lifted off. Inside the box, the outfit is wrapped in tissue with a sticker on it that reads ‘Surprise!’ Below are some of the outfits that are available from Petalina. I hope you have enjoyed reading all about these beautiful dolls and that you can sense my enthusiasm for the range. 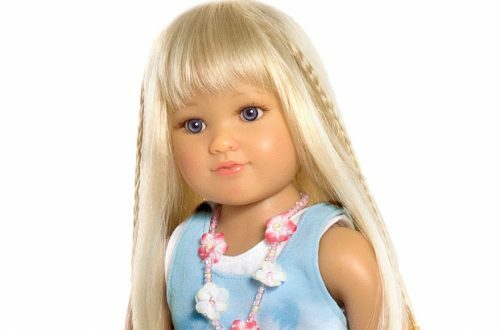 Bonnie & Pearl dolls are completely and utterly gorgeous and I am so pleased to be able to offer them to you at Petalina.